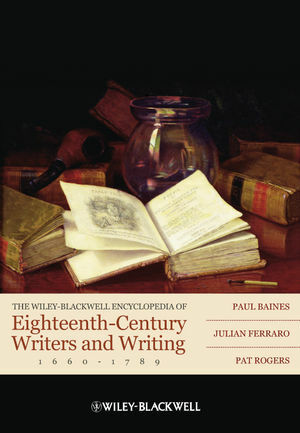 The Wiley-Blackwell Encyclopedia of Eighteenth-Century Writers and Writing1660-1789 features coverage of the lives and works of almost 500 notable writers based in the British Isles from the return of the British monarchy in 1660 until the French Revolution of 1789. Paul Baines is Professor, School of English, University of Liverpool. He is the author of The House of Forgery in 18th-Century Britain (1999), The Complete Critical Guide to Alexander Pope (2000), The Long Eighteenth Century (2004), and Edmund Curll: Bookseller (with Pat Rogers 2006), and editor of Five Romantic Plays 1768-1821 (2000). Julian Ferraro is Lecturer, School of English, University of Liverpool. He is the author of several articles on literature of the period and is one of the editors of The Poems of Alexander Pope in the Longman Annotated English Poets (2010). Pat Rogers holds the DeBartolo Chair in the Liberal Arts, University of South Florida. He is one of the foremost authorities on eighteenth-century literature and has written or edited over thirty books on the period. He has worked extensively on Alexander Pope, Samuel Johnson, Henry Fielding, and Daniel Defoe, among many others. His recent publications include The Alexander Pope Encyclopedia (2004), Pope and the Destiny of the Stuarts (2005), and the edited collection, The Cambridge Companion to Alexander Pope (2008).